Walker: I'm an imperfect man. "It's only by the blood of Jesus Christ that I've been redeemed for my sins." Kasich: "The Lord's not picking us," but because we're so good at lots of stuff, He wants us to succeed. I wish Trump got this question. Kasich: This is a movement to restore common sense. Also God. "We've got to unite our country again." Kasich: I do believe in miracles. Cruz quotes the Bible: "You shall know them by their fruits." I saw him do this at #CPAC2015 . He means conservatives prove chops in deeds. Cruz says God speaks through the Bible, which he reads every day. The president of the United States has to be a proven conservative. Okay, this last question is just an invitation for the candidates to appeal to evangelical voters. Cruz: God talks to me every day, actually. I'm the son of a pastor. He gave his heart to Jesus. He was an alcoholic and left first. Paul: "Do you borrow money from China to send it to anyone? Out of your surplus you can help your allies...Israel is a great ally." Huckabee has a statistic about how old the B52s are that US has in service. But aren't there more sophisticated fighter planes now? Huckabee seems to have forgotten that the U.S. military has functioned as a social experiment -- that's what integrated units were. Huckabee gets question about transgender people in the military. Says it's not social experiment. "We've forgotten why we have a military. Carson is completely avoiding this question. Like, in a really obvious way. Ted Cruz is succumbing to a Bobby Jindal syndrome in which he says stuff people will of course like, but it has no umph, seems self-evident.
.@BretBaier brings up news that Qassem Suleimani is going to visit Russia. Trump: Our president doesn't have a clue. He's incompetent. 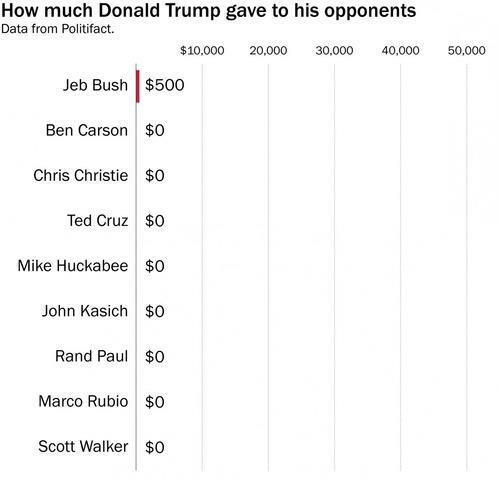 Washington Post fact-checked Trumps claim that he's given a lot of money to most of his opponents on stage. There's an NWA movie coming out? I should watch TV more often. 1st commercial after Walker's policing comments is preview for Straight Outta Compton, a movie about NWA. I have Cruz logged as only speaking 3 times in the 1.5 hours we’ve had this debate thus far. Walker, on policing: "It's about training. It's about making sure law enforcement professionals...have the proper training." Is it just me or did Paul pause after that marriage/guns line, like he was expecting more applause? Trump dismissed as "political correctness" a question from Fox News moderator Megyn Kelly, who asked him to answer charges that he was part of a "war on women." Rand Paul: "I don't want my marriage or my guns registered in Washington." #GOPDebate crowd: "Woo!" Kasich pretty much slam-dunked the gay marriage question. Kasich: "I just went to a wedding of a friend of mine who happens to be gay." #GOPDebate "We need to give everybody a chance."